KAMPALA. Justice Flavia Anglin Senoga has overruled the defence lawyer’s request in the pine car bond murder case to have originals of the forensic reports brought to court from the Government Analytical Laboratory (GAL). In her ruling, Justice Senoga concurred with State prosecutor, Mr Alex Ojok’s reply that as a procedure, GAL sends to court stamped carbon copies and keeps the originals. He said the defence lawyers’ insistence on the original report might stall or delay the trial for another year as the lab is filled with bulky files. On August 7, one of the defence lawyers, Mr Evans Ochieng’s had objected to the tendering in of copies of forensic documents from GAL which was the evidence in the killing of a businesswoman, Betty Donah Katusabe saying that they are carbon copies with some documents written in ink writing within different pens. Mr Ochieng had told court that most important areas in the documents were detailing the DNA and swabs as exhibits which need a crucial analysis, however, they are just mere photocopies which would necessitate the state to present their originals or find an officer from GAL to own them. Today court heard that cuffs with their pair of keys that were allegedly used to fasten the hands of the deceased before her torture where recovered from the home of one of the suspects’ Paul Tasingika, in Namungoona a Kampala suburb and were all wrapped in his wife’s dress and kept in a suitcase. “We also recovered four mobile phones without SIM-cards in possession of Tasingika. As police officers we were forced to retain the items as exhibits because some of the eyewitnesses at the scene of the crime told us that at the time the deceased Katusabe was being tortured, her hands were fastened in handcuffs,” Detective Henry Peter Walya the investigating officer testified. The suspect Tasingika is facing charges of murder alongside the owner of Pine Car Bond, Mr Muhammed Ssebuwufu, Godfrey Kayiza, Philip Mirambe, Stephen Lwanga, Yoweri Kitayimba, Damaseni Ssentongo and Shaban Otuddu. 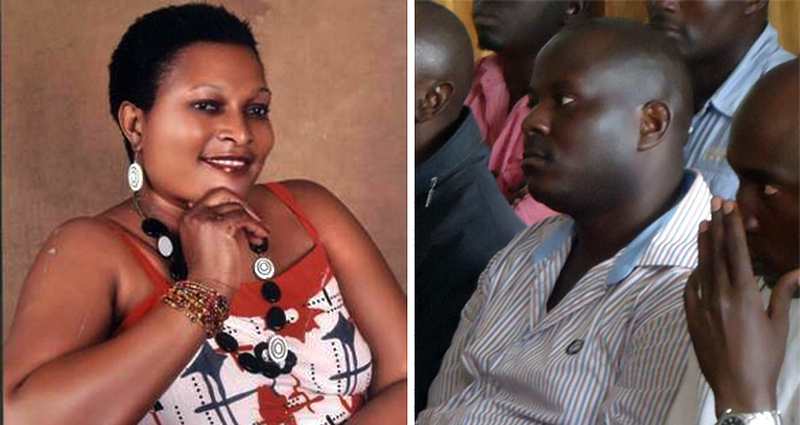 The prosecution contends that the accused persons and others still at large, on October 21 at Pine car bond on Lumumba Avenue in Kampala killed Katusabe and robbed her of her mobile phone valued at Shs300, 000 and immediately or after the said robbery, used a panga and sticks harm her which caused her death.